How does painting an entire room in less than an hour sound? Tired of uneven paint? The thought of prepping paint, and brushes make you dread painting? Now you don’t have to worry about that at all! 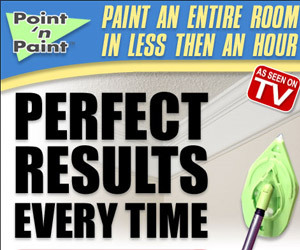 With the new Point N’ Paint, you can paint an entire room in less than an hour! Get perfectly even paint on the walls and you’ll never imagine painting to be as easy as this! Glide around moldings and paint around light fixtures with ease.